Almost half a century ago, a cohort of Alabama state troopers and Dallas County sheriff’s deputies confronted about 600 civil rights protesters in Selma. The resulting mayhem — a melee of stinging tear gas, lunging police dogs, and a charging white civilian posse on horseback — injured 60 marchers. Captured by television cameras and later broadcast on ABC to 48 million viewers, the attack on March 7, 1965, became known as “Bloody Sunday,” the emotional climax of a movement that later that summer led to the landmark Voting Rights Act. At the time of the march, about 15,000 black adults in Dallas County were old enough to vote. But only 130 were registered, having slipped past a literacy test and other civil impediments. “It is hard for us to comprehend,” said Evelyn Brooks Higginbotham, chair of Harvard’s Department of African and African American Studies, starting a panel discussion Thursday at Tsai Auditorium marking the exact anniversary of Bloody Sunday. Luckily, there was a witness and interpreter on hand from those days long past, Andrew Young, who has been an activist, minister, mayor, congressman, and U.S. ambassador to the United Nations. For a late-afternoon audience of 200, his reminiscences were an aid to comprehension. “A Freedom Fighter Looks Back” was co-sponsored by Higginbotham’s department, the W.E.B. Du Bois Institute for African and African American Research, the Center for American Political Studies, and the Black Policy Conference at the Harvard Kennedy School. Moderated by Daniel Carpenter, the Allie S. Freed Professor of Government, the event was billed as a conversation with five respondents who study the Civil Rights Movement as history or as practical theology. Young was not the only corrective presence during the session. There was King himself, captured in an audio clip from a 1965 mass meeting. “You always have to listen to him,” said Barnard College sociologist Jonathan Rieder, “not just read him.” The clip was a scratchy reminder of King’s extemporaneous power. “We are moving up a mighty highway towards the city of freedom,” he said. There was also the corrective sound of music, with two a cappella freedom songs from the Kuumba Singers, the group founded at Harvard shortly after King’s death. If there was a leitmotif to the event, it was the idea of a prophet’s “madness,” his moral prescience. King entered the jail fearful and depressed, but had an awakening there, thanks to a published letter from eight Southern white ministers. Civil rights, they insisted, should be settled in the courts instead of in the streets. McWhorter said that letter had “zero impact” on the concurrent Birmingham protests. But the protests themselves were, in 1963, “the 20th century version of Gettysburg,” she said. March 7, 1965, became known as “Bloody Sunday,” the emotional climax of a movement that later that summer led to the landmark Voting Rights Act. “It is hard for us to comprehend,” said Evelyn Brooks Higginbotham, chair of Harvard’s Department of African and African American Studies. One of the co-sponsors of the event was the W.E.B. Du Bois Institute. 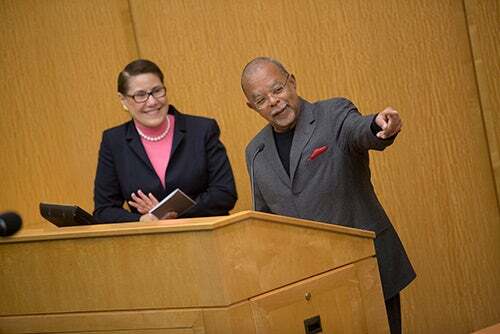 Henry Louis Gates Jr. (right) is its director. Young’s role was also to get far to the right of King, to appear as conservative and careful as possible, so King “could come down in the middle,” he said, and appear moderate. After King confronted war in 1968, he decided to confront poverty, which he regarded as a civil rights affront as well. That year, said Young, King was on the verge of promulgating a new era of civil rights that would expand the notion of justice to the poor. “To end poverty was just to expand the New Deal to the poor,” Young said of King’s plan, and he wanted to bring to a heaping table the 30 percent of Americans who had not yet entered the middle class. King was assassinated that year. Offshore tax havens these days are the repository of as much as $35 trillion, he said, a sign that the fight against poverty should be the new frontier for civil rights.